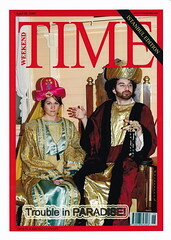 This is a fake Time Magazine cover taken from a cheap and tawdry Turkish restaurant fake cultural experience in Istanbul. Obviously, when we were given the opportunity to pay 40 dollars to dress like the sultan and sultan’s wife, we quickly said yes. Last night I proposed to her. She said yes. Then she proposed to me. I said yes. Now I’m engaged. The wedding is going to look something like this picture, but slightly more over the top. We aren’t registered anywhere, but we’re thinking (I’m thinking) eBay. Either way, I’ll let you know for when you want to buy us used jeans or first edition winnie the pooh’s. so we don’t inadvertently discard any old jeans.